Dear Kairos readers, it's my pleasure to present YOUR 2017 Dragon Award recipients! Sincere congratulations to all of the winners! 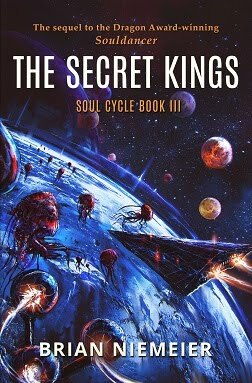 On a personal note, I've been receiving condolences from readers since The Secret Kings didn't win Best Science Fiction Novel. Thanks. I appreciate the sentiment, but don't worry about me. I already have a Dragon Award for Souldancer, and even if SK had won, I wouldn't have gotten the award. If anything, it's a shame that Jagi wasn't recognized because her work is overdue for it. Be that as it may, the Dragons are a fans' choice award, so this is all about YOU. And boy, do you have reason to celebrate! John Scalzi was the point man for the CHORFs' destruction of the Hugos. 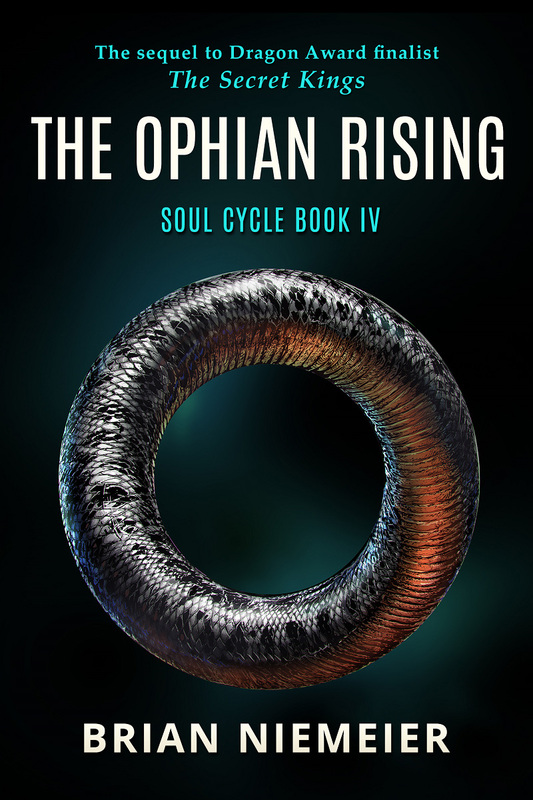 Under the aegis of works typified by his crass Star Trek fanfic, Scalzi's benefactors at Tor Books logrolled him to four Hugo wins in fifteen years--as many as Robert A. Heinlein won in four decades. He is the standard-bearer for those who put politics before merit. A Scalzi win is a red flag that an award is entering decline. 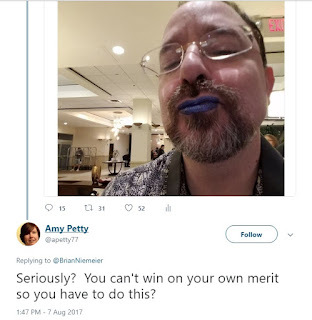 Luckily, Scalzi realized that his participation in the Dragon Awards would destroy the Hugo clique's narrative that the Dragons were illegitimate. That's why he's withdrawn from the Dragon Awards twice. But he's also a savvy self-promoter who knew that declining too many nominations for a people's choice award would alienate the fans who nominated him. So this year he got back in the ring after initially bowing out. That was a win for normal fans because now the CHORFs can't claim that the Dragon is a fake award unworthy of a Hugo-winning author. 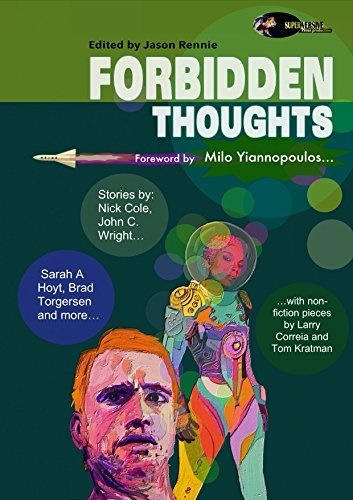 NB: Remember when SF SJW Greg Hullender accused Dragon-nominated authors of being white supremacists? By Greg's own logic, darlings of the Hugo clique like Scalzi and the folks who voted for him must also be white supremacists, right? I trust you can see why it's vital that purveyors of such weapons grade stupidity be kept from gaining undue influence over a fan award. And I'm not talking about disenfranchising anyone. A level playing field is the bane of all CHORFs. That's why they try their best to tip the scales in their favor by appealing to authority, like they did when they badgered Dragon Con into reversing its sensible decision not to let authors withdraw nominations bestowed by the will of the fans. Luckily, the final decision still lay with the vast legions of science fiction and fantasy fans. Shutting out the CHORFs was the only way to reverse the inroads they'd made and safeguard the Dragon Awards from political meddling. And you guys came through with flying colors! Take a look at that list of winners again. It's wall-to-wall best sellers and fan favorites. In short, the most popular nominees won the popularity contest. The process worked! Does that mean I'm less popular than James S.A. Corey? Absolutely. I have no problem losing to a dude with his own TV show. What matters is that the Dragons have already grown beyond the ability of any one group to dominate the awards. If you cast a ballot, you made this happen. Give yourself a pat on the back! 35% more votes cast in round 2 than round 1. 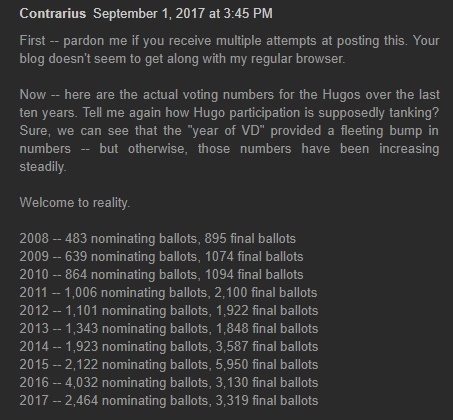 Almost four times more nominating ballots and more than twice as many final ballots were cast in the 2017 Dragons than in the 2017 Hugos. 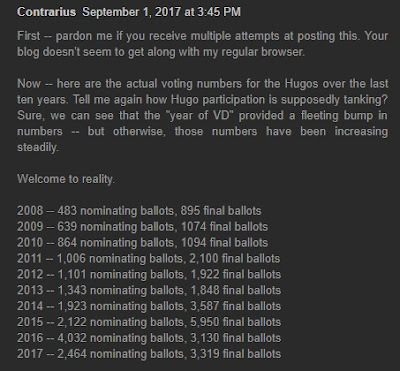 Plus, Dragon Award nominating ballots doubled compared to last year, while Hugo nominating ballots were nearly halved. People who hate most of their customers still control pop culture, but you guys just took back a big chunk of it. And your numbers are growing. Fire Emblem Heroes didn't win Best Mobile Game. That is the true injustice here. 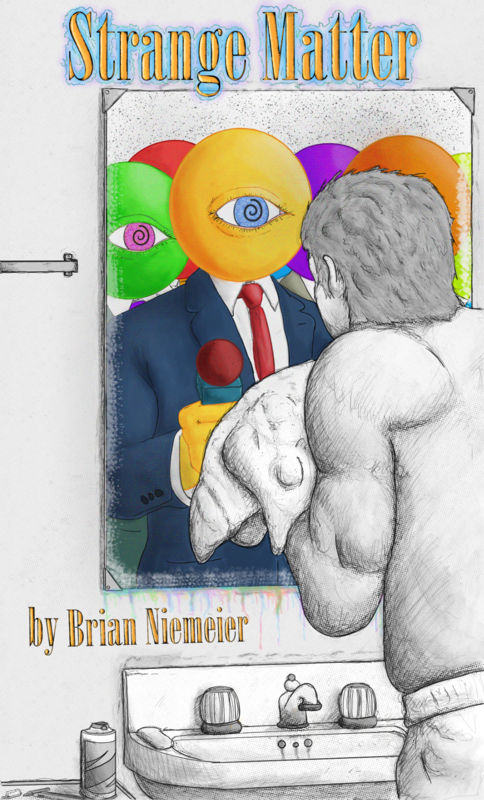 EPIC LEVELS of WIN, Brian! The SJWs and CHORFs are inside a "Xanatos Gambit" trap, mainly of their own making. No matter which way they play, they tip their hand as to true intent (destroying Culture and Civilization), decrease their reader base (for authors), cut into profits (for the Big 5 and B&N), and unwittingly advertise the things they hate (Dragons, Indie Publishing, Pulp, Superversive, Western Civilization, etc). 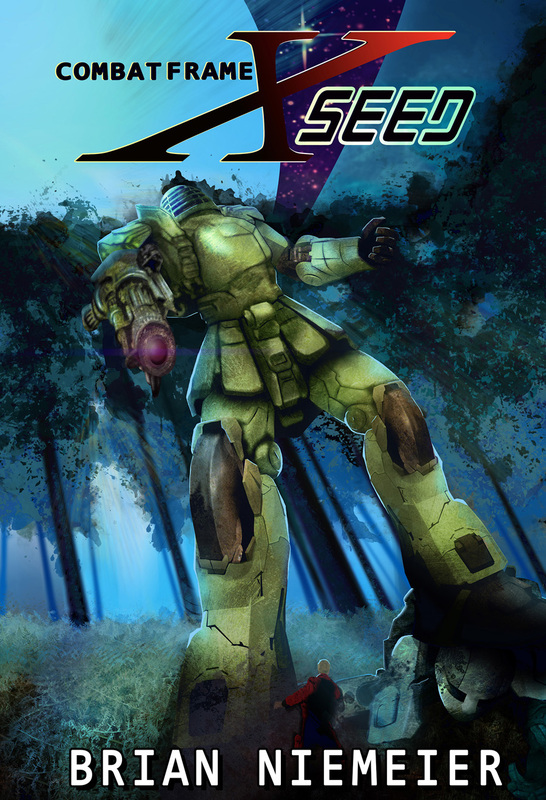 It'll be hard to argue the Hugos are relevant after this. But I know CHORFs are already on the attack to declare them not "representing the community" because the wrong people voted. That's fine. They can whither and die while the Dragons grow. What I expect the Dragons to kill besides the Hugos is the NYT Bestseller category listings. When major awards fall, expect that NYT is next. Also doesn't hurt that NYT readership's average age is what, 70 or 75? SJW/CHORF innumeracy is what amuses me. The argument then becomes "Well sure more people voted in the Dragons, but they voted wrong" and they swirl further down the bowl. At no point will there be self-reflection as to if maybe what they like is not as good as they profess. After all, they're always right. They have no sense of humility after all. I think you all and a very few on the hard left are the only ones that see this as a battle of civilaztions Hugo vs Dragon awards all or nothing two men enter throw down. After all, multiple awards have existed for a long time. The Nebulas don't lessen The Hugo's and neither do The Dragons. Think of it as The Oscars and the People's Choice Awards. Yep, Oscars and Hugos in the same category. Naw Brian just wants to see a small hateful clique get shown for what it is. Their arrogant behavior has damaged the industry they purport to love and chased many away in the process. Now the clique is aware at how small it truly is and they'll do anything to make themselves look like the winners. Because they never lose. 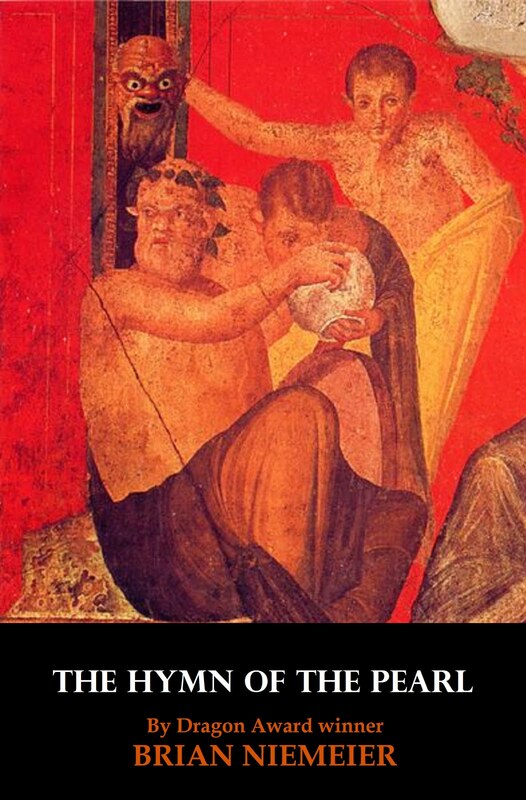 Hugos have been around for decades. The Dragons are two years old and growing. Give it a few more years and I expect to see the vote totals reach five to six figures annually. BTW, allow me to add my congrats to James SA Corey too. I feel no shame in losing to a duo that has the backing of millions of fans of their TV show. You said it. Mr. Corey is reaching and entertaining millions of fans. They showed up to vote for him, and Bob's your uncle. Yes there are multiple awards,but never with this different an outcome. None of th Hugo winners picked up a Dragon. They are talking to 2 different audiences, one a lot bigger than the other. Dragon participation has gone up and Hugo participation has gone down. One audience is small and shrinking and the other is large and growing. This is what people have been saying since Sad Puppies I. The Hugos were always the biggest award in the genre. Now they're not. The Dragons are and they've barely started. If that doesn't represent a large fall from grace then what does? There is also a problem with the Oscars / People's Choice analogy. The Oscars folks do not pretend to represent the movie going public. They are very clearly an industry only operation. The Hugo folks on the other hand do claim to represent SF fandom (tru-fandom), and use the claim as a badge of authority. If you have an award claiming the same, but with more people behind it, yeah your "we are the true fans" thing falls flat. They are speaking to 2 different audiences, but the Hugo folks claim to represent the same audience. The Hugo folks do not represent the people who actually buy the books and watch the shows. That is what the Dragons just proved. When have they done that? The Hugo was always supposed to be the fan choice award. The industry only award (the Oscar) was the Nebula. The whole point of the puppy wars was over the question of how representative the Hugo currently is of actual fan taste. The difference between the Dragon and Hugo results would tend to clear that up. Here's to DragonCon 2018, it can only be better. If they can keep this up, the dragons will easily surpass the hugos in the next few years as the "go to stamp" for good reads. Congrats to all the winners and finalists. I hope that all especially those that didn't win any awards keep producing works that we can enjoy in our free time.